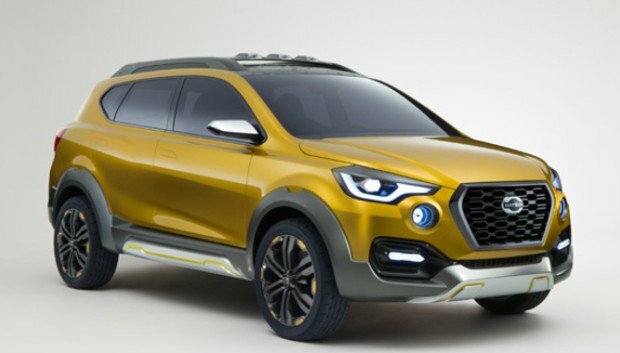 The Go-Cross is a concept vehicle which Datsun had unveiled at the 2015 Tokyo Motor Show. This car is lounged in June 2017. The Go-Cross is a concept vehicle which Datsun had unveiled at the 2015 Tokyo Motor Show. The Go-Cross is crossover vehicle with a raised body providing more ground clearance giving it a muscular stance. In the front of this car the engine has the 1.2-litre three-cylinder petrol to be the standard offering. The first model in the Datsun line-up to be offered with a diesel engine, which, in this case, will be the 1.5-litre dCi that powers a variety of Nissan and Renault models. A five-speed manual will be common across all variants. The contrast coloured body kit which for this concept car is grey around the sides and silver on the pseudo bash plate elements. Datsun has fitted this concept car with projector headlamps and LED DRLs which will become standard headlights when the vehicle goes into production. The large hexagonal grille at the front is surrounded by a thick chrome bezel accompanied by the wrap around headlamps. The fog lamps are located at a higher position which gives the Go-Cross a beefy appeal. The front bumper has a skid plate in the bottom centre which compliments the aggressive look of the concept. The crossover is also equipped with roof-rails, additional body panelling, large alloy wheels, and gets a roof mounted spoiler on the tailgate completing its stylish look. The interiors of the Go-Cross concept have not yet been disclosed by the manufacturer.